Cover: Aerial of Bayfront Park in 1950s. 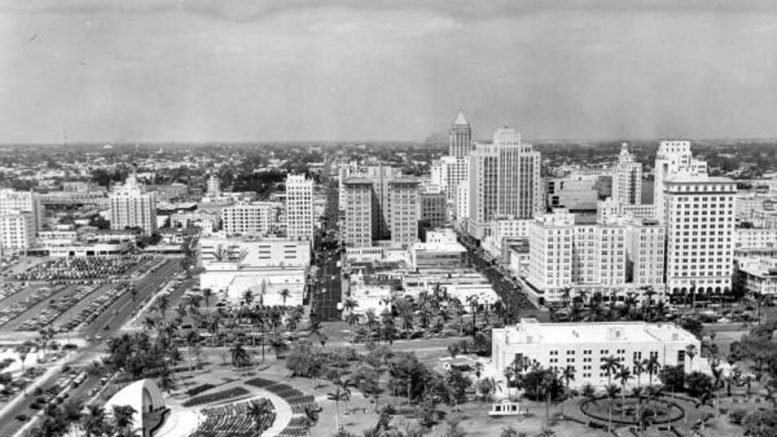 The second part of the episode on Bayfront Park in downtown Miami covered the history from 1950 until the present. The middle decade of the twentieth century represented a time of transition for the park. There were plans to dramatically change the configuration to include a convention center or to use part of the park to provide additional surface parking. In the end, the only dramatic change was the replacement of the R.C. Gardner Band Shell in 1950. The turbulent 1960s was a time when downtown residents were fleeing the city for the suburbs. The park became somewhat dormant and was given very little attention. The next decade represented more of the same. It wasn’t until the 1980s that the city decided to invest in the park by hiring famed landscape architect Isamu Noguchi to redesign the park. The redesign in the 1980s led to the demolition of the bandshell on the south end of the park and the library in the middle of the park. However, it did provide for a new amphitheater and a large fountain with a promenade walkway stretching from the fountain to Biscayne Boulevard. It wasn’t until the residential building booms of the new century that Bayfront Park became a hub of activity with families and activity seekers. The addition of a residential urban density has attracted visitor and residents to the park. However, the park is often closed due to its dual-role as an event venue in addition to green space for downtown residents. Tune into part 2 of the History of Bayfront Park to learn more. Watch the preview and if you like what you see, join the channel to access the full episode. Joining the Miami History Channel is easy and inexpensive. Click on the ‘Subscribe’ menu option to join today!